In the 19th Vow Amida promised that those who do various meritorious deeds in order to be born in the Pure Land will be welcomed by Him into the Pure Land. The various meritorious deeds mean they continue to practice many kinds of meditative and non-meditative practices. 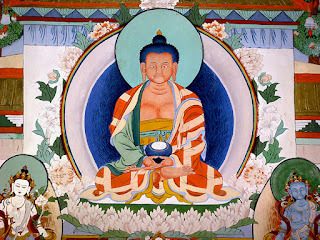 For example, whenever they do a visualization or contemplation of Amida in accord with the Contemplation Sutra or even when they do other meditation techniques (meditative practices), when they observe precepts, do a good deed like saving a life, abstaining from meat (non-meditative practices), etc., they think this will help them to be born in Amida’s Pure Land and actually transfer the merit of these practices (meditative or non-meditative) toward their future birth there. Usually followers of various schools do meditation practices or observe precepts, etc., in order to become a Buddha in this life, like Shakyamuni, but practitioners of the 19th Vow change the goal of these meditative and non-meditative practices towards attaining Buddhahood in the Pure Land of Amida. They change the direction of their Buddhist practice toward Amida Buddha. This is the difference between them and other Buddhists, and this difference makes them to enter Amida’s influence and guidance. In the 20th Vow Amida promised that those who exclusively say His Name but consider this recitation to be their own virtue and a practice that depends on their own capacities will also be born in the Pure Land. So, the followers of the 20th Vow make another important step further into the Light of Amida Buddha. They do not stop at meditative and non-meditative practices, but among all practices they chose only one, which is to say the Name of Amida. However, they are still dependent on their own power and their faith in Amida is not absolute. According to Shinran the followers of the Primal Vow immediately become Buddhas when they are born in the Pure Land, but those who are born in the Pure Land through the gate of the 19th and 20th vows do not immediately become Buddhas but due to their clinging to personal power they continue to stay there in an unenlightened state of mind until they overcome their doubts and attachments to their so called merits and virtues and entrust entirely to the Power of Amida. The 18th is the Vow of direct entering into the Pure Land, while the other two (the 19th and 20th) are Vows of indirect entering. It is like a house with three doors. The main door leads directly to the owner and in His presence you become like Him (a Buddha sharing the activity of Amida). This central room of the Pure Land is called the Fulfilled Pure Land or the True Recompensed Land. The second and third door are leading to an anteroom or waiting room where you have to stay for a while until having access to Him. This anteroom or waiting room to perfect Enlightenment in Amida’s Pure Land is called the borderland of the Pure Land or the realm of indolence and pride, the city of doubt, the womb like palace, the transformed Pure Land, etc. Birth in the border land is not a punishment, but practitioners actually keep themselves there by their doubts and clinging to their own power. It is important to emphasize that both the Fulfilled Pure Land and the Transformed Pure Land (border land of the Pure Land) are the results of the Vows of Amida Buddha, so they are not different realms, but two aspects of the same Pure Land. As I said, those born in the Fulfilled Pure Land are followers of the true faith (shinjin) of the 18th Vow (Primal Vow) and they immediately attain Nirvana or Buddhahood, while those who are born in the Transformed Pure Land are followers of the 19th and 20th Vows. The later are people with mixed faith, and so they need to stay for a while in that place until they overcome their doubts. As Master Shan-tao called it, birth in the Fulfilled Land of the Pure Land is called “Inconceivable Birth” and all those born there „are endowed with bodies of Naturalness, Emptiness, and Infinity”. To have bodies of Naturalness, Emptiness and Infinity means to become a Buddha or to attain perfect Enlightenment. “It is because of doubting the Buddha-wisdom that, although born in that land, you remain in the borderland”. In the borderland or the realm of indolence and pride". “The fault of doubting Buddha-wisdom is grave. Entrust yourself to inconceivable Buddha-wisdom”. "How sad it is that the ordinary, ignorant people who possess defilements and hindrances, from the beginningless past up to the present, have had no opportunity for deliverance because their minds vacillate between meditative and non-meditative practices (19th Vow). As I reflect upon the cycle of transmigration, I realize that it is difficult to take refuge in the Buddha’s Vow-Power(Power of Amida’s Primal Vow/18th Vow) and enter the sea of great faith even in the passage of kalpas as numerous as the number of particles obtained by grinding the earth. How deplorable it is! I should deeply sorrow over this. Generally speaking, sages of the Mahayana and the Hinayana and all good people hold to the auspicious Name of the Primal Vow as their own root of good (20th Vow). For this reason, they cannot awaken faith, realize Buddha wisdom, and understand Amida’s intent in establishing the cause of Birth (18th Vow); hence, they cannot enter His Land of Recompense". The desire to eradicate one's karmic evil through saying the Name arises from the heart of self-power; it is the basic intent of people who pray to be in a state of right-mindedness when their lives end. It therefore reveals an absence of shinjin that is Other Power." In the same way, a person who thinks he can be born in the Pure Land by transferring the merits of his meditative or non-meditative practices in accordance with the 19th Vow must also be diligent in this pursuit during his whole life and maintain a good state of mind in the moment of death if he is to reach the borderland. “If we entrust ourselves to Amida's Vow that grasps and never abandons us, then even through unforeseen circumstances, we commit an evil act and die without saying the Nembutsu at the very end, we will immediately realize birth in the Pure Land. “I was taught that practicers who lack shinjin are born in the borderland because of their doubt concerning the Primal Vow, and that, after the evil of doubt has been expiated, they realize Enlightenment in the fulfilled land. Since practitioners of shinjin are few, many are guided to the transformed land. To declare, despite this that birth there will ultimately end in vain would be to accuse Shakyamuni of lying”. Again, I stress the importance that both the “Transformed Land” and “the Fulfilled Pure Land” (or “True Land of Recompense”) are aspects of the same Pure Land of Amida Buddha, just like the anteroom and the main room are part of the same house. As usually, the owner of the house (in our case – Amida Buddha) prefers to stay in the main room together with His faithful sons and daughters (followers of the 18th Vow), while those who have a mixed faith (followers of the 19th and 20th Vows) keep themselves in the anteroom. It is not the fault of Amida or a punishment that some are born in the borderland of the Pure Land (Transformed Land), just they are kept in that region by their own doubts. They are the ones who are keeping themselves out of the main room of the Pure Land, not Amida Buddha, so when they overcome their doubts, they will also join the Fulfilled Pure Land and immediately attain Nirvana (Buddhahood). “How sad it would be to abide in the borderland instead of being born directly into the fulfilled land, even though one has the fortune of saying the Nembutsu”. The 18th, the 19th and the 20th Vows are the three Vows of salvation which give deliverance from birth and death to all beings that rely exclusively or partially on Amida Buddha, who have absolute faith or still cling to their so called power and merit but wish to be born in the Pure Land. Because these three Vows – and especially the 18th – are mentioned in the Larger Sutra on Amida Buddha, Shinran considered its deliverance to be the main reason for Shakyamuni’s appearance on earth, while the Contemplation Sutra where visualization of Amida, transference of merits and the nine grade of aspirants are mentioned and the Smaller Amida Sutra (Amida-kyo) where the recitation of the Name alone is encouraged as the root of all virtues, are provisional means for those who still can’t rely exclusively on Amida Buddha. If we read the Contemplation Sutra we see that among those born in the Pure Land through directing their merit in one way or another there are various grades and differences. Not all are equal. The more the virtues, the better the place one occupies in the Pure Land, for example, the higher level of the highest grade, the middle level of the highest grade, the lower level of the highest grade, then the higher level of the middle grade, the middle level of the middle grade, and so on, until the lowest level of the lowest grade. But no mention is made there about those who enter Amida’s Pure Land through faith alone as in the 18th Vow (Primal Vow). The various levels are established only according to the personal virtues of the practitioners in their previous life when they transferred the merit acquired through various meditative or non-meditative practices and through nembutsu recited in self power. What does this mean? Why are those born through faith alone not mentioned in any of these categories? According to Shinran this is because they immediately become Buddhas when they are born in the Pure Land, and for Buddhas there are no categories in which they can be classified. Shinran Shonin, Kyogyoshinsho – On Teaching, Practice, Faith, and Enlightenment, translated by Hisao Inagaki, Numata Center for Buddhist Translation and Research, Kyoto, 2003, p. 233. and Kygyoshinsho, Ryukoku Translation Series, Ryukoku University, Kyoto, 1966, p. 162. It is thus called because those born there are far removed from the true bliss of the Pure Land just as those in a border land are less benefited by civilisation. cf with Tannisho – Notes Lamenting Differences, Ryukoku Translation Series, Ryukoku University, Kyoto, 1962, p. 41, fn 1. It is thus called because those born there are too proud to believe in the Buddha’s Primal Vow whole-heartedly, and due to the lack of faith they are not so dilligent as to advance to the True Land of Recompense. cf with Tannisho – Notes Lamenting Differences, Ryukoku Translation Series, Ryukoku University, Kyoto, 1962, p. 41, fn 1. It is thus called because those born there have to stay in the Transformed Land due to the sin of doubting just as though pent up in a castle. cf with Tannisho – Notes Lamenting Differences, Ryukoku Translation Series, Ryukoku University, Kyoto, 1962, p. 41, fn 1. It is thus called because those born there are like being inclosed in a lotus flower and can neither see the Buddha nor hear the Dharma. cf with Tannisho – Notes Lamenting Differences, Ryukoku Translation Series, Ryukoku University, Kyoto, 1962, p. 41, fn 1. See the next chapter, “The Name of Amida Buddha is the Great Practice”. Birth in the Transformed Pure Land by the followers of the 19th Vow is called Birth under the Twin Sala Trees” (Sojuringe Ojo). Birth in the Transformed Pure Land by followers of the 20th Vow is called “Incomprehensible Birth” (Nanji Ojo). The word “ incomprehensible” is used with two meanings: 1) to praise their attainment of Birth in comparison with a lower mode of Birth attained by the followers of the 19th Vow and 2) to depreciate it in comparison with a higher mode of Birth attained by the followers of the 18th Vow.